Some owners tend to fire coaches quickly and keep general managers around for years, even if the team doesn’t have success (see Bryan Colangelo for the latest example of this behavior). The Portland Trail Blazers, though, take the opposite approach. Andres (Dre) Alvarez (who is co-authoring this post) made the following observation: An odd note on Portland. They’ve changed GMs 3 times in the last several years but basically kept the same coach. It’s possible Paul Allen (the owner) understands that the coach isn’t as important as the person making the personnel choices. That said I don’t know if he’s properly handling the GM position. The latest victim of Paul Allen’s approach to Portland’s GM position is Rich Cho. Allen hired Cho last summer. And before the playoffs are over in 2011, Cho has been fired. From the perspective of the fan, the primary job of a GM is to pick the players (not get along with the owner). And although Cho was only in Portland for about 10 months, we did get a chance to see some of his decision-making (and fortunately for us, Basketball-Reference.com reports the moves made by each GM). July 21, 2010: Signed Wesley Matthews as a free agent. Wesley Matthews is young and has been slightly below average in his first two seasons. At around $6 million a season he’s worth the money. He’s not a steal but he was a good value (and he turned out to be above average this year). October 23, 2010: Traded Jerryd Bayless to the New Orleans Hornets for a future 1st round draft pick. Bayless is a former first round pick for the Blazers and has not been a productive NBA player. So Cho rerolled on this with another pick. October 25, 2010: Signed Fabricio Oberto as a free agent. One year deal, less than a mill and doing it to deal with the knee fairy. Not a great move but not like free agent cheap bigs grow on trees. November 6, 2010: Signed Sean Marks as a free agent. Not a great pick up but he was cheap and. . . .
January 24, 2011: Signed Chris Johnson to a 10-day contract. 10 day contract is not exactly a back breaker. Also young unknown. February 24, 2011: Traded Dante Cunningham, Sean Marks, Joel Przybilla, cash, a 2011 1st round draft pick and a 2013 1st round draft pick to the Charlotte Bobcats for Gerald Wallace. March 1, 2011: Signed Jarron Collins to the first of two 10-day contracts. March 14, 2011: Signed Chris Johnson to a contract for the rest of the season. Hasn’t been playing hot but BR lists his season pay as $27 thousand. Low risk cost. Here is how Andres summarizes all these moves. and used some ten day contracts to put warm bodies on the court. In short, from a personnel handling decision he did exactly what he was supposed to. Also a lot of the lows of this season (Oden and Roy injuries) were outside of his control. This looks like another case of appearance (looks good as a GM, think Colangelo I guess) trumping actual performance (he made good roster moves and his team made the playoffs). The numbers support Dre’s assessment. First, here is the productivity of the Blazers’ players this year; as well as what we would expect from the veteran players given what they did in 2009-10. 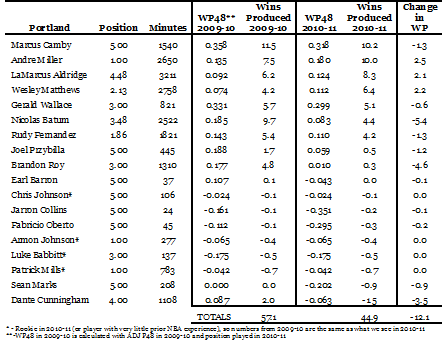 As one can see, the Blazers – given what the veterans did last year – could have expected to win 57 games in 2010-11. The team’s Wins Produced this year, though, was only consistent with a team that won 45 games. When we look at the individual players, we see that much of the team’s decline can be linked to the play of Brandon Roy and Nicolas Batum. The moves by Cho appear to be a reaction to these problems. Roy was hurt in 2009-10, and given Roy’s production, it was unlikely that Blazers could easily replace Roy’s value if the injury problem persisted in 2010-11. But Mathews could be thought as a reasonable insurance policy (and again, Mathews did turn out to be slightly above average). The decline of Batum was probably something that couldn’t be easily predicted. But the trade for Wallace –who has been a very productive NBA player – could be considered a reaction to Batum’s decline. When we look at the roster employed in the playoffs we can see that these moves might have paid off. Here is what the Blazers’ playoff roster would have been expected to do across an 82 game season, given the minutes and positions played in the playoffs, and the per-minute performance with the Blazers in the regular season. To put this in perspective, the same exercise for the NBA’s Final Four reveals (i.e. teams in the Eastern Conference Finals and teams in the Western Conference Finals) – prior to the Conference Finals – the following projections for each team (again, projection based on minutes and position played in the playoffs and per-minute performance in the regular season). So Portland’s playoff roster compares favorably to the top playoff teams. And remember, the Blazers suffered some issues (injuries to Oden and Roy, decline in Batum’s production) that Cho could not have prevented. All of this suggests – from the fan’s perspective – Cho was not a bad GM. From the owner’s perspective, though, a different conclusion was reached. And that highlights an aspect of NBA management that I think many fans don’t consider. To be a successful coach or general manager, you don’t just have to make good decisions. You also – and this is probably more important – have to get along with other people. This list of other people includes the players, other coaches, other people in the front office, and of course the owner. If you can’t do that – as Cho discovered — you are not going to stay in your job. And if you can do that – as Bryan Colangelo has apparently discovered – you can keep your job even if you don’t do a very good job of building a playoff team. So if you are dreaming of working in the NBA someday, you might want to spend less time thinking about how to build a team and more time on your interpersonal communication skills. Those skills will probably be more important than anything you know (or don’t know) about basketball. It is incorrect to say that Cho signed Wesley Matthews. Matthews was a restricted free agent and signed an offer sheet with Portland on July 10, 2010, before Cho was hired as GM (which was on July 19). Accordingly, Cho didn’t actually do anything substantial to sign Matthews – the terms of the offer were already in place before Cho arrived on the scene; he just finalized the contract after Utah declined to match. Have you ever considered building a program to quantify trades a la Hollinger? That is, it could calculate the expected change in WP (or WP48) from swapping the players. You could possibly assign an estimated value to picks as well. Obviously this wouldn’t factor in salary, chemistry, risk/reward, etc., but it could atleast factor in known commodities and perhaps replacement values. Hello, I agree that Mr. Cho was wrongly dismissed. Still leave Mr. Colangelo alone (who,by the way, pointed out the issues with Roy’s from draft day). You seemed to have exercised the same judgment of Mr. Allen: we do not like someone, so there isn’t going to be any objectivity in our slandering of that person. Strangely enough Toronto tough Media ended up supporting Mr. Colangelo and his resigning. May be because there was more to the story than what appeared to the unknown parties (like you). So please support Mr. Cho’s worthy cause, but stop ganging up on Mr. Colangelo. You should do more background research to understand what happened there, and you should stop being bothered by the fact he looks good. It is quite strange how often you bring this up. I’d like to add that it seems like these are small sample sizes being mentioned in this post. ie. A few good moves by Cho and a few bad moves by Colangelo may not be sufficient enough evidence to conclude that one GM is better than the other. A better assessment would examine at the entire careers of both men. Also one may need to control for other variables in order to establish a cause-effect relationship. Thanks. At this point any transaction info I use will be from a place like BR or Hoopshype so sorry if it is not all accurate. I apologize if I slandered Paul Allen. I know I’ve laid into him a bit on twitter. That said could you please tell me where I slander him in the article? Sample Size! +10 points! That said let’s actually use that. In a very short sample size Cho did well but was fired. In 4 years (I’d say a big sample size) Colangelo took a 47 win playoff team to 41 wins (playoffs) 33 wins, 40 wins, 20 wins. In short he has done nothing to improve the team and arguably failed on one of his only real tasks (keeping Bosh) As such I was surprised to hear he got re-hired and thought his comparison was apt. Also why would comparing the entire careers (by the way that post is Cho’s entire career) be a good move for assessing if Toronto should have re-signed Colangelo? E.g. does his signing Steve Nash in Phoenix over a five years ago really have any impact on how he’s done in Toronto? To add to A.S. observation that Wesley Matthews was signed before Cho’s hiring, there was a report in the PortlandTribune that the Gerald Wallace deal was a pre-exisiting opportunity and happened because of Larry Miller’s relationship with Jordan: “During Cho’s time on the job, two major deals were struck – the trade that brought forward Gerald Wallace from Charlotte and a contract extension for coach Nate McMillan. Insiders say Miller – through his Nike relationship with Michael Jordan, now majority owner of the Bobcats – and assistant coach Bernie Bickerstaff drove the Wallace deal, and that Miller was the one who pushed Allen to re-sign McMillan.” So, it’s difficult to ascertain Cho’s contributions without knowing all the details of the transactions. Tino Brandon Roy in one game does more for the Blazers than Andrea Bargnani has done in his entire career for the Raptors. Colangelo drafted Bargnani and he will go down as the worst #1 pick of all time and he may go down as the least productive player in NBA history. What’s Bryans reaction to this overwhelming lack of production? Unwavering support and a big contact that will pay Andrea 10 million a year. Throughout his time in Toronto he has shown a consistent lack of understanding of the qualities needed in players to make a winning team. He traded for Hedo and J. O’Neil, drafted Bargnani and Derozen, got nothing for Bosh. In a smaller move I think clearly displays his poor ability to evaluate NBA players he literally chose Linas Kleiza over Matt Barnes when he couldn’t sign both. I fear all GM’s may suffer from small sample size. A GM typically is only making 5-10 major personal decisions per year. Add in the fact that players aging patterns aren’t easy to predict, I imagine there would be a lot of inconclusive results. Also as mentioned before, take a look at Memphis GM Chris Wallace. Everyone agreed he was an idiot for trading Pau Gasol, until Marc Gasol became a really good player this postseason. If Marc regresses to a 0.50 player, will Wallace still be a good GM? And what if he trades Marc for a 2nd round pick? But what if he picks Michael Jordan 2.0 with that pick? I do believe in GM quality, but results isn’t the determining factor. The key is making the decisions based on the right criteria that will lead to an overall positive net result. Cho could still be a “bad” GM if Gerald Wallace hurts his himself playing Water Polo in Macedonia, such that he can never play in the NBA again. As for Colangelo, if he built a productive team in Phoenix, as has generally been considered, and he builds a poor one in Toronto, which is a better representative of his talent level? I think him trying to put pieces around Bosh in order to keep him, ruined his first few years with the roster. Of course, he didn’t pick the right pieces, but more important to him was “looking good” with the moves, as to convince Bosh to stay. Once Bosh left, he’s had one year to rebuild the team in his image. If somehow he’s able to package Bargnani to a team desperate for scoring, and pull back some productive players, I would think that his time in Toronto was generally good. Remember, there are external pressures and circumstances which influence a GM’s decision, whether it be owners, fans, or players. Would we think Colangelo was so terrible if Bargnani had decided to hit the free agent market a couple of years ago rather than signing long-term?